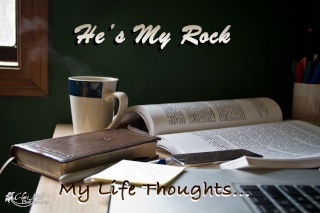 He's My Rock: What if a question could change your life? I know all too well that it is incredibly easy to live life selfishly. To live life seeking our own happiness. But the Bible makes it so clear that those who have been born again are to live a life seeking to glorify Christ in all we do. There are so many other verses that talk about living for Christ, shining His light, seeking Him, etc...(Rom 12:2, 2 Cor 5:17, Matt 6:24, Matt 6:33, Phil 4:8, 1 Pet 1:13, James 1:22-27, Heb 13:5, the list goes on!). It's so simple. So point-blank. EVERYTHING thing we do should be in the name of the Lord Jesus. But yet, it's so hard. Hard to ignore our fleshly desires. But what if we changed our entire mindset with one simple question? A question I should be asking myself far more than I do. And not just asking this question, but responding with a heart fully desiring to seek Christ. "Is what I'm doing right now ultimately glorifying to Christ?" What if you asked that question before you began any task, any project, hung out with anyone, listened to a song, read a book, spent time on social media? anything. And what if after you asked that question, you answered it honestly? We so often let ourselves live a life so full of complacency and a desire for self-fulfillment. We seek the things of earth, where moth and rust destroy, rather than the things of God. But how would our lives change if we continually lived life with a mindset to glorify and serve Him in absolutely everything? If we stopped, looked at every situation in our life and asked ourselves, 'Is what I'm doing right now ultimately glorifying to Christ?" Can you ask yourself this question throughout the day and honestly answer it, "yes."? I pray you can and I pray the same for myself. Don't give into your own fleshly desires. Seek Christ. In EVERYTHING. I just found your blog and am really enjoying looking through your posts. Its actually funny because what I've been reading of yours sounds a lot like how I write and think through things! Keep on seeking the Lord and putting His will first in your life!